Come pay your respects to the spirit of Jimi Hendrix! 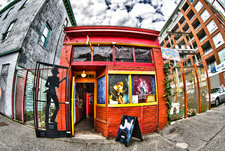 This shrine features old pictures and memorabilia of the neighborhood as well Jimi Hendrix and family. You can also rent the shrine to host private events. Before the Georgia Viaduct was expanded in 1972, the neighborhood of Hogan's Alley housed Vancouver's African-American population. At the heart of this community was Vie’s Chicken and Steak House, where locals and visitors alike would stop to get a warm bite of soul food. The shrine used to be part of Vie’s, where Jimi's grandmother, Nora Hendrix, worked as a cook for many years and lived nearby. Jimi spent much of his childhood in Vancouver, as his parents often dumped him under the care of relatives. In addition to numerous summer vacations, Jimi even attended school in Vancouver for a brief time. Vie's hosted a number of visiting black performers such as Nat King Cole and Louis Armstrong. These artists would eat at Vie's after concerts, once the restaurant had closed to the general public. It is believed that Jimi and his cousins would stay up late helping their grandmother serve these famous musicians. After being discharged from the Army, Jimi returned to Vancouver during the winter of 1962- 1963 to practice his music, he even played shows on Granville Street. Neighbors say that Jimi lived in this building and would practice his guitar after hours. If you listen on a quiet night, you can still hear him playing. Jimi Hendrix's roots can be traced to the neighborhood Hogan's Alley. His grandparents, Nora and Ross Hendrix immigrated to Vancouver in 1911. There they raised Jimi's father, James Allen Hendrix, who moved to Seattle in 1941 where he met Lucille Jeter, Jimi's mother.